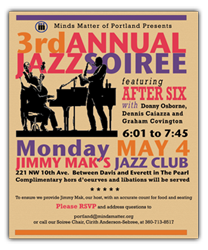 The videos were recorded live at Jimmy Mak’s premiere jazz club in Portland, Oregon. They feature vocalist, Thea Enos, whose jazz phrasing has been described as subtle and emotional with behind-the-beat phrasing. She is back by the After Six trio of Graham Covington on piano, Dennis Caiazza on bass, and Donny Osborne on drums.